Let’s be clear what kind of growth degrowth needs to challenge: the growth of biophysical throughput, continuous capital accumulation and productivism, as well as mindless attempts of boosting GDP – or, what we call the growthocene. Lately there has been a rising interest in degrowth – an umbrella term that critiques the centrality of economic growth in our societies and embraces various alternatives for ecological sustainability and social justice (see Kallis et al., 2015). This interest is shared not only by the proponents of degrowth, but also its critics, who often support many of the ideas behind degrowh, but have reservations about using the term. It seems to us that these reservations at least to some extent arise from economic growth itself being an ambiguous and contested concept. For example, Kate Raworth suggests that it is not clear whether degrowth refers to the decrease of the economy’s biophysical throughput or its monetary value, measured in GDP, and argues that the difference matters. Or, John Bellamy Foster proposes that it is important to argue not ‘for degrowth in the abstract, but more concretely for deaccumulation – a transition away from a system geared to the accumulation of capital without end’. These reservations about degrowth point to the need to clarify what growth itself means and hence what degrowth critiques and what growth traps to avoid when making a transition to sustainable degrowth. In what follows, we articulate three ways of understanding growth that should be challenged by degrowth: first, reliance on biophysical throughput; second, capital accumulation and productivism more generally; and third, perpetual strive for quantitative expansion of national economies (measured in GDP). We also propose that growthocene can be a suitable way to characterise the epoch we live in, broadening the notion of capitalocene while opposing the now mainstream notion of anthropocene. 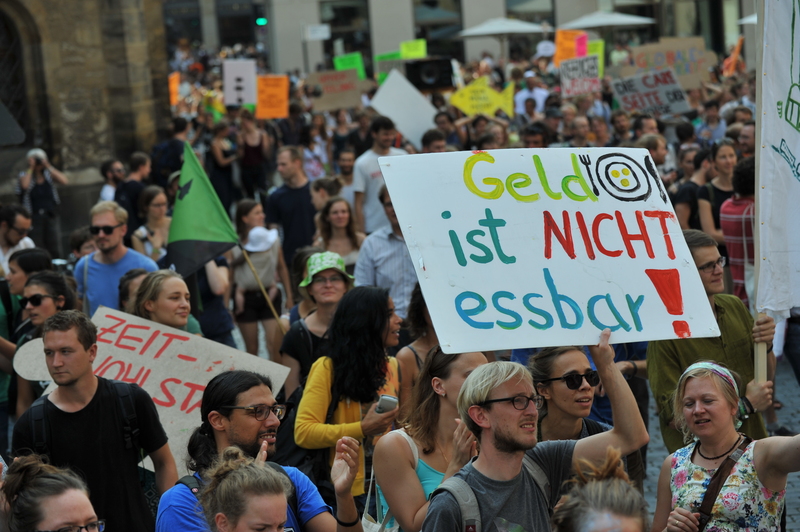 Degrowth demonstration, Leipzig, 2014. Source: commons.wikimedia.org. Economies across the world rely on growth of biophysical throughput, which has led to severe ecological consequences for Earth and its ecosystems. As a result, degrowth involves descaling of biophysical throughput. This critique of growth has been partially integrated into the mainstream discourse also, captured by the notion of anthropocene. However, this concept is deeply problematic as it suggests that all human beings are responsible for the ecological crisis. Differences related to class, gender, race, geopolitics or economic systems themselves are glossed over or totally disregarded. Green economy has become a buzzword that is often suggested as a solution to the world’s ecological problems, whether by the left or right. Such economy, however, is neither sustainable nor just because it focuses on incorporating the (supposedly) green solutions into the economy with all its flaws and divisions rather than changing the economy itself. For example, the economic valuation of nature is green only on paper, in reality allowing for continuous ecological destruction and the appropriation of local governance too (see Kill, 2015). Or, renewables are of course an important way forward for generating energy, but the transition to them does not automatically lead to sustainability or justice. For instance, in Brazil, the way the shift to renewable energy is implemented, on top of challenging the biodiversity of the Amazon, often puts into question the very way of being of indigenous communities and the livelihoods sustained and inhabited by them (e.g. as the case of Munduruku Indians demonstrates). So in striving for sustainability and justice, degrowth goes beyond the question of biophysical throughput and the physical limits of our planet. This involves challenging the problematic and potentially harmful solutions positioned as ‘green’, such as the carbon and biodiversity markets or nuclear energy. This also involves problematising how these proposals have been promoted under the appealing banners like ‘inclusivity’, ‘poverty reduction’, ‘development’ etc. Therefore, more generally, the questions what is at risk, who benefits and who loses from the proposed solutions are crucial and, pushing this line of thinking further, what societal divisions, injustices and inequalities are maintained, reproduced or enforced. The latter point brings us to challenging growth understood as capital accumulation. Not only are the conditions under which capital accumulation occurs demarcated by class, gender, race and other divisions, but when surpluses are reinvested in the economy, these divisions are amplified even further. In short, the strive for accumulation relies on injustices and inequalities, which has been powerfully scrutinised by a broad spectrum of critical theories, including anarchism, feminism, Marxism and postcolonial thought. Some of this critique has been captured by the notion of capitalocene, which suggests that capitalism, and not all humanity, is responsible for the ecological and also social problems we are facing (see Haraway, 2015; Malm, 2015; Moore, 2014). The popular slogan ‘system change not climate change’, then, should imply not only a systemic change in the way we deal with climate or ecology, but in the very way our societies are organised. Degrowth also problematises the forms of accumulation, and, mirroring it, consumption, with a ‘sustainable’ or community-oriented appearance. For example, the notion of the sharing economy has been debated as something that often commodifies the social and communal spaces and makes use of precarious labour conditions (see also Schor, 2014). While capitalocene is a powerful idea to understand ecological and social problems without decoupling them, it does not capture the whole picture. For example, it struggles with how to grapple with the environmental history of the former Soviet Union and the Eastern Bloc, whose economic systems, too, had devastating ecological and social consequences. Industrial production was the key driving logic for organising these economies, if not in shaping their entire societies. Therefore, it is important to challenge not only capital accumulation, but more broadly productivism, that is, the growth of production as desirable in itself. Apart from industrial production, this includes many other forms of production found in contemporary economies as well, such as production of information, knowledge, technology and services. However, it is also crucial to note that challenging productivism does not suggest descaling of all production as there are different types, ways, consequences and understandings of it. For example, it would be desirable to see more permaculture as a sustainable production practice in agriculture. Or, expansion of initiatives like platform cooperativism, as opposed to the ‘sharing economy’, would also sound appealing to many. In line with the argument that has been presented so far, we suggest using the notion of growthocene – i.e. the strive for perpetual growth consisting of reliance on growth of biophysical throughput, continuous capital accumulation and productivism more generally – to describe the epoch we live in and the ecological and social problems we are facing. Degrowth, then, captures both the conditions and the consequences of the growthocene. Kto-kogo ? Dognat’ i peregnat’ [Translation: Who will (beat) whom? To catch up and overtake]. Soviet Poster, 1919-1930. Source: National Library of Scotland. The perpetual strive for quantitative expansion of national economies is in line with prioritising production as desirable in itself, which is part of the growthocene. The problematic assumption behind this is that quantitative expansion automatically leads to an increase in prosperity. Based on this assumption, GDP is the dominant measure of the monetary value of national economies. It was introduced as a tool for the US government to deal with the Great Depression and then to plan production during the Second World War, but became the central measure of the national economies’ monetary values. GDP and other similar measures, on top of being inadequate indicators of prosperity, have problematic consequences. First, they produced a norm, which allowed countries with lower national incomes to be ‘analysed and framed in a way that suited their assumed future compliance with the industrialized model’ (Speich, 2011: 19). Second, gearing crucial public institutions, such as education and healthcare, towards increasing GDP has created systems that are often exclusive and where the attention has been driven away from the core functions of these institutions to economic demands. So while degrowth is not aimed at shrinking GDP or the monetary value of the economy, we would also like to stress that degrowth should not be evaluated in light of GDP and similar measures as these are essentially flawed indicators of prosperity. GDP has been convincingly criticised by many scholars already (e.g. Fioramonti, 2013), but this remains part of the task of degrowth too, due to its hegemonic status. To sum up, the strive for growth – or the growthocene – is manifest in reliance on growth of biophysical throughput, continuous capital accumulation and productivism more generally. Hence degrowth can be understood as descaling of biophysical throughput, deaccumulation and anti-productivism, and aimed at bringing together the alternatives not tied to these. Such an understanding does not decouple ecological and social problems. It acknowledges that capitalism bears a large share of the responsibility, but is not the only system that has led to the problems we face today. It also highlights that productivism itself is part of the problem and hence bewares of proposing solutions rooted in its logic. *Ekaterina Chertkovskaya is part of the degrowth theme at the Pufendorf Institute for Advanced Studies and the Sustainability, Ecology and Economy research group at the School of Economics and Management, both at Lund University. She is also a member of the editorial collective of ephemera journal. *Alexander Paulsson is part of the degrowth theme at the Pufendorf Institute for Advanced Studies and the Sustainability, Ecology and Economy research group at the School of Economics and Management, both at Lund University. He is also a postdoctoral researcher at the Swedish Knowledge Centre For Public Transport.